All of Vicki’s sculptures, with the exception of a few small pewter pieces, are cast in bronze. 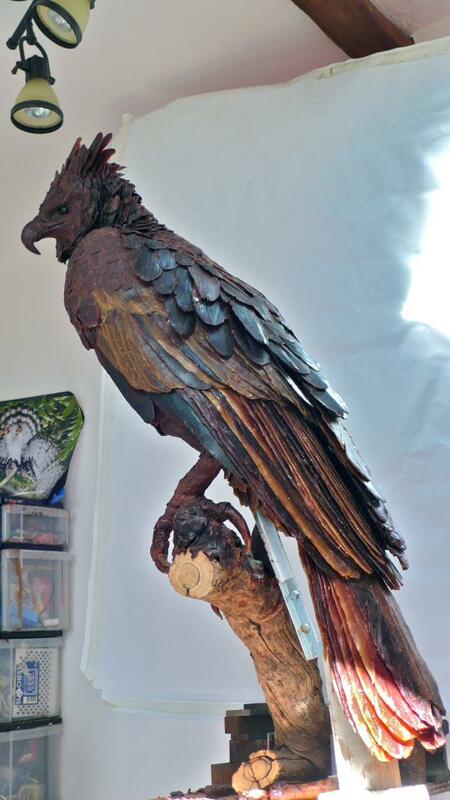 The entire process is labor intensive and spans multiple stages, known collectively as the “lost wax technique.” Since every piece Vicki creates is one-of-a-kind, often incorporating found antiques and natural objects, the exact sculptures you see here may no longer be available for purchase. But don't worry! A similar piece may already exist in her inventory, and if not, you can commission one precisely to your specifications. Every sculpture begins with an idea. Vicki spends time sketching her subjects - from live models or video footage - to get a feel for their personalities and the way they move. The sculpting process itself starts with wax (though you could use almost anything: clay, wood, even fruits and vegetables! The hedgehog pictured here uses toothpicks to create the effect of quills). Once Vicki has a design in mind, she will frequently construct an armature out of wire in the general shape and pose of the sculpture-to-be. Onto the armature, she will begin to build warmed, soft, dark brown wax - teasing life out of the malleable material. Once she is satisfied with her creation, the next step is making a silicone mold, from which all future copies of the sculpture can be made. From this silicone mold, a duplicate of the original sculpture is made, again in wax. At this stage, Vicki usually modifies her original design to fit the unique base or found object with which the future sculpture will interact. These changes can be as small as curving the toes of a crow just slightly to wrap around a particular perch, or as big as repositioning an owl's head so it can stare in another direction. Even if she chooses not to make any major changes to the wax before the bronze is cast, a wax copy rarely if ever pops out of the silicone mold without some flaws that Vicki will have to correct before the final stages of the process. This wax copy is coated in liquid sand and cooked until a ceramic shell is formed, with a small opening in the bottom for the wax to melt out. Into this ceramic shell, now, molten bronze is poured. Once the bronze has cooled and hardened, the shell is broken off. 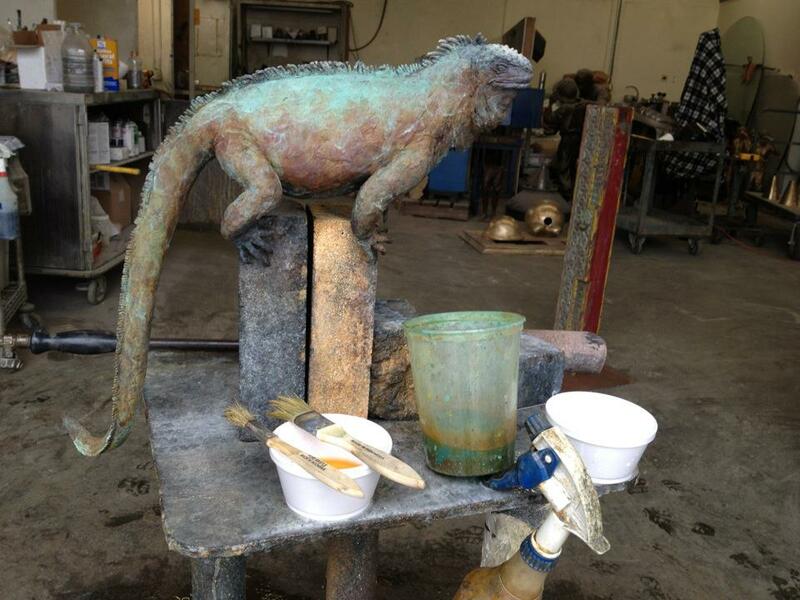 Raw bronze is a pale shiny material; to achieve the colors you see in her work - the burnt oranges and reds of the marine iguana, the inky black of the crows - Vicki applies chemical patinas in various combinations that react with the metal in different ways. After all this, nearly every sculpture is then mounted on a base of some kind (be it a vintage typewriter, stone fountain, or piece of antique farm equipment - to name just a few), and the process of attaching the bronze to that base can require quite a bit of engineering, problem-solving, troubleshooting, and creative solutions (as seen here, where rubber bands and a hammer keep the songbird sculptures in place on their new base while the epoxy hardens).